Hank JD Sleek the DJ of Heartbreaks will be commanding the airwaves between sets with a special Country Soul DJ set. We are delighted The Hot House Four+1 will be returning to the Country Soul. Since swapping their television for a piano, in 2013, The Hot House Four progressed from jamming in the lounge to a band in a matter of months. Willy Briggs together with his wife Lisa teamed up with their daughter Lola and Mr Dan Morley to play some early American roots music. Now they could be classified as The Hot House five with the addition of the very talented Mr Tim Heming on clarinet. THHF+1 blend a creative mix of Western Swing, early jazz, blues and rag with twin guitars, accordian, lap steel, harmonica, mandolin, clarinet and upright bass all of which can be heard in their extremely cool musical vibe. Their latest long player "Old Havana Moon" (Shelby Records), arrived to fine reviews and was a top ten LP in our own Country Soul playlist. The Boot Heel Playboys are coming back to the Country Soul! Formed in 2017, TBHP are a Western Swing outfit in the vein of the seminal Bob Wills & The Texas Playboys. 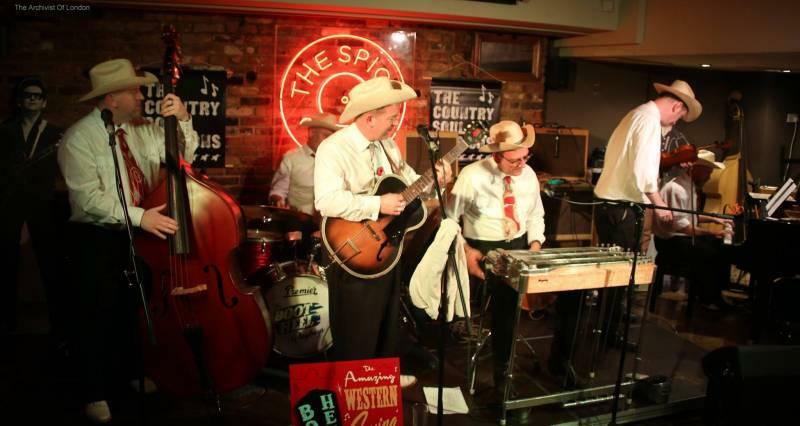 Playing an authentic mix of classic 1940's / 1950's country and western swing dance tunes accompanied by fine originals compositions the playboys are a "toe tapping, two stepping, be-bopping bunch of a band that sets out to get you dancing"! Featuring founder and chief instigator Phil Morgan on his "Bigsby" steel guitar, Ewan Penky on double bass, Julian Marshall & Chris Haigh on fiddle, Tim Pearson on his "kelso" piano, John Bidder on drums, Dan Edwards guitar/banjo, Ray Mott trumpet and Mr Dave Madgewick on vocals and rhythm guitar duties. These well respected musicians follow in the giant footsteps of such musical luminaries as Bob Wills and The Texas Playboys, Tex Williams, Johny Lee Wills and other fine Western Swing artists of the day. Don't miss them and be sure to bring your dancing shoes!